Buttons are not just for clothing, they are fantastic for arts & crafts! These 12 diy button arts & crafts put to good use all of those collected buttons leaving you will some very useful and stylish buttony items. From jewelry to kids crafts to wall art we have all of the button inspiration you need right here. Button bookmarks are super cute, useful and make great gifts! Find out more about these lovely bookmarks here. Bubble print butterflies is a fun craft activity to do with kids. Children will love the bubble painting as well as sorting out and selecting the buttons for their butterflies. Click here to read the full tutorial. Create button heaven with this GIANT button wall art. Follow this link to get the tutorial. Get a head start on Christmas with these adorable snowmen ornaments. Head over to Cutesy Crafts to find out more. Arrange your buttons then pour over a resin to create your own unique serving tray. We love this fall tree design! Click here to read the full tutorial. This darling love heart wall art would look lovely in a child’s bedroom or the craft room. Learn how to make it here. Button cards are a great way to get really creative. Turn buttons into flowers, bikes or create an underwater scene. Read more about these button flower cards here. So bright, so colorful, just so beautiful! This project lasted Lil Blue Boo, aka Ashley Hackshaw an entire year. Each day she stitched on a new button and added some extra stitching and we think it looks incredible! A resin button bracelet is a great project for anyone who loves working with resin. Click here to read the full tutorial. Update your keychain/ keyring with this cute diy button cluster. Find out how to make it by clicking here. These are the coolest button bracelets around, and you can make them! Not only can you make them but they are also a very simple project for anyone to make. Follow this link to find out more. Button doll charms will keep older children and adults happy and busy. This button craft is perfect for people with a bulging button collection. Visit Scrapping Tonight to get the step-by-step tutorial. 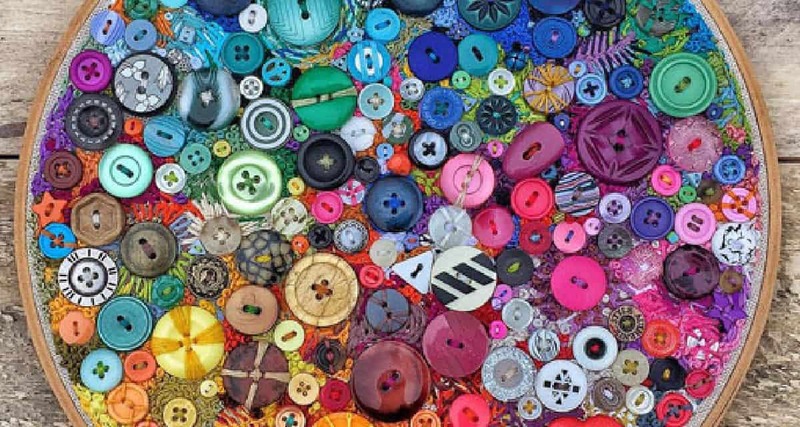 Needing more button inspiration then check out our 10 Enjoyable Button Craft post here.